1. 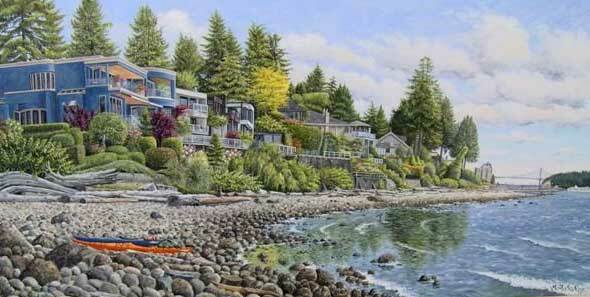 Gray Rock (Quarry Rock) / Deep Cove. The trail to Gray Rock is 3.8 km, easy to average difficulty – we’ve seen people of all ages with dogs doing the hike. The view is breathtaking; actually, the header of this page is a part of what you see when you get to the top. The Rock overlooks the area from Belcarra Park in Coquitlam to pretty much Downtown and Stanley Park. 2+3. 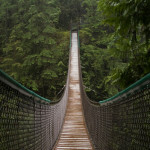 Lynn Canyon suspension bridge + Lynn Canyon pool / Rice Lake. See this article from a few weeks ago. 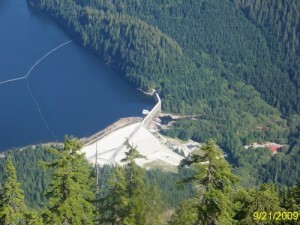 The dam was built in 1927, and re-built in 1961. 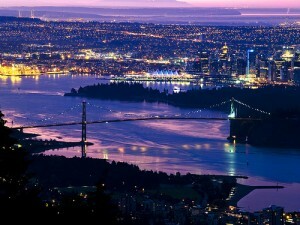 It is the main source of clean water in North Vancouver. The water in this river is a few degrees warmer due to it being fed from a large reservoir behind the dam, from which a constant flow of water is released. 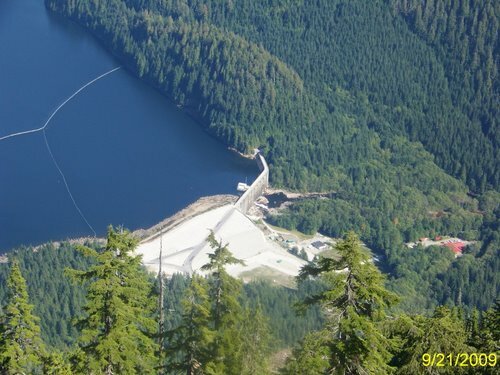 The dam is 12 km away from the Lynn Canyon Park, so it is definitely possible to visit them on the same day. 5. Lonsdale Quay with the park and the pier nearby. 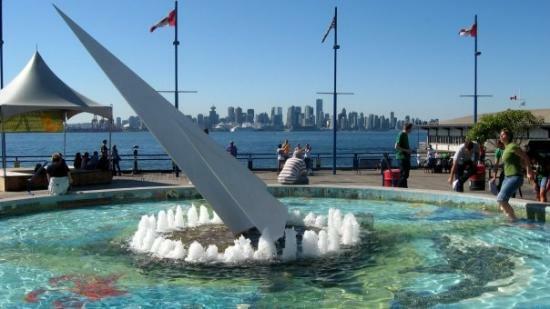 Lonsdale Quay is a popular tourist destination. 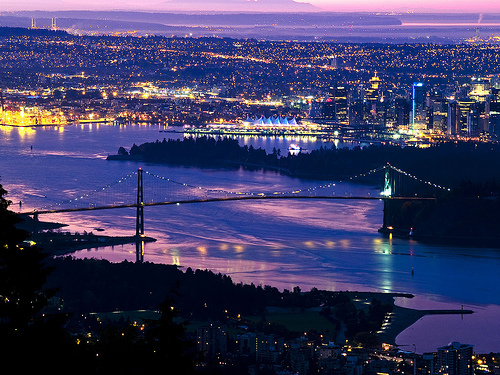 If you are coming from Downtown via Seabus, the Quay is where you arrive at. There is a large multi-level market with a full-sized food court; on the West there is a very nice park with large lawn, and a long pier to the East. You should visit Lonsdale Quay twice: during the daytime for the food, and at night when the sky rises light up – for the view of Downtown. There are two stationary free binoculars at the Quay: one on the first floor by the stairs outside, and the other one at the pier. During the 2010 Winter Olympics it was a venue for Aerials, Moguls, Ski and Snowboard Cross, Parallel Giant Slalom and Half-pipe. 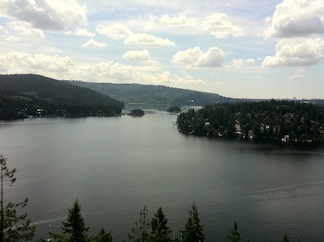 As much as I like it in snowy months, IMHO, there is nothing much to do on the Cypress Mountain during summer. 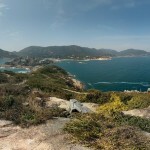 However, the viewpoint is open all-year, and the view is different each season. 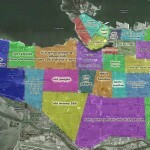 The main disadvantage is that it is not transit-accessible. 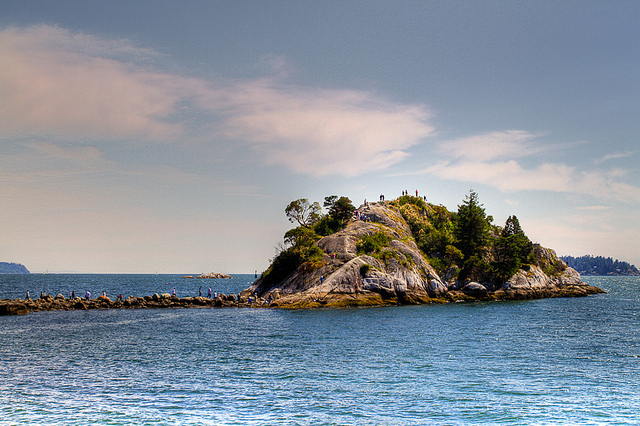 Lighthouse Park and Whytecliff Park are about 8 km away from each other. Both are transit-accessible and have parking. We jumped from cliffs in both, and the while the water temperature was well below 20°C, it was bearable. 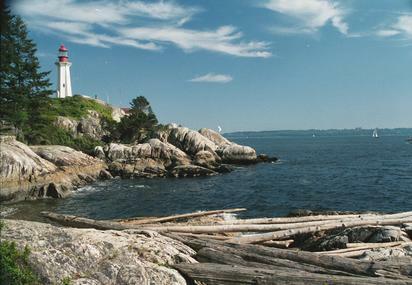 Even though you can see the lighthouse from not too afar, you can not enter neither it, nor the adjacent property, as the lighthouse is still operating. If you are a history enthusiast (as I am), make sure to look out for the abandoned WW2 structures :soldier: (like a small gun fort). 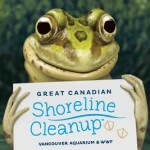 When you are at Whytecliff Park, make sure to watch the tide level, as you can get stuck at the cliff when the water rises (it happens more than you think, even to the best of us). These two beaches are located in the Southern part of West Vancouver. 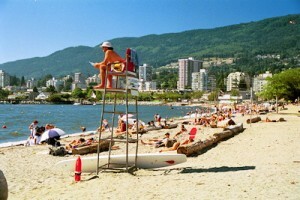 Both beaches are public, Ambleside being 450m long, and Dundarave 50m; both are fairly well-kept, with lifeguards on duty during some summer months (safety first). I’ve seen people surf there during excessively windy days; and sometimes there are large cruise ships sailing past the beach.